Very smart programming for National Theatre Live to re-release “Frankenstein,” directed by Danny Boyle and starring Benedict Cumberbatch and Jonny Lee Miller,” in time for Halloween. It certainly is creepy, especially when you can see the “Monster’s” eyes (Johnny Lee Miller) in closeups when he realizes he can think and act independently, which you would totally miss in a theater. Really ugly, but sensitive and emotional, the Monster tries to fit into human society, but is shunned, which leads him to seek revenge against his creator. But he is rejected, essentially, for being different. And that’s scary, given how people who are different, unattractive, physically disabled or had “massive weight gain” are talked about by Presidential candidate Trump who seems to be a role model for many people. It returns to movie theaters beginning Oct. 25. Cumberbatch also returns in the title role of “Hamlet,” beginning Nov. 15. The Encore Series closes with the international hit “War Horse,” from Dec. 6. The play is much more theatrical and visceral on stage than is the 2011 movie because of the remarkable Handspring Puppet Co., the genius behind “War Horse.” Learn about it in this TED Talk video. “Harry Potter and the Cursed Child” is running at the Palace Theatre in London. Is the secondary ticket market finally under siege on both sides of the Atlantic? Yes! And it’s about time. Sen. Charles Schumer (D-NY) is proposing stiff fines for reselling Broadway tkts and in London “Harry Potter and the Cursed Child” is refusing to honor tkts not sold by legit vendors. In some cases — like for “Hamilton” — we’re talking hundreds if not thousands of dollars. Ouch! “Hamilton” star and creator Linn-Manuel Miranda and Broadway League President Charlotte St. Martin are supporting Schumer‘s sponsorship of legislation that would impose a $16,000 fine on those who use automated ticket purchasing software to purchase tickets online.What’s not clear to me, at this point, is that per transaction? If not, paying the fine could be cheaper — much cheaper — than scalping tkts, as it used to be known. The story on Playbill.com doesn’t say. The Olivier Awards, the British equivalent of Broadway’s Tony Award. Judi Dench, who since 1998 has received 7 Oscar nominations — the most earned after age 60 by any performed — last night took home her eighth Olivier Award, more than any other actor has ever collected. Dench won for best supporting actress for her performance in “The Winter’s Tale,” produced by the Kenneth Branagh Theater Company, a troupe he spent around two years putting together. The Olivier Awards, the British equivalent of Broadway’s Tony Awards, were announced today in London. The ceremony is scheduled for April 3. The Olivier Award nominations for 2016 — the 40th anniversary year of the Awards — were announced today. On the heels of Mark Rylance’s well-deserved Oscar win for Best Supporting Actor in “Bridge of Spies” yesterday, he was nominated today for Best Actor in the Shakespeare’s Globe West End transfer of “Farinelli and the King.” The play received a total of 10 nominations. The televised announcement was hosted by Michael Ball and Imelda Staunton, best known in this country for playing Dolores Umbridge in the “Harry Potter” movies. She also was a nominee for one of the greatest theatrical roles for women, Momma Rose in the London revival of “Gypsy,” which moved from the Chichester Festival Theatre to the West End’s Savoy, The production itself earned eight nominations, the most of any other shows. Staunton has performed in a variety of plays and musicals, winning three Laurence Olivier Awards; two for Best Actress in a Musical for her roles as the Baker’s Wife in “Into the Woods” (1991) and Mrs. Lovett in “Sweeney Todd” (2011) and one for Best Supporting Performance for her work in both “A Chorus of Disapproval” (1985) and “The Corn is Green” (1985). The Chichester Festival Theatre also sent “Guys and Dolls” to the West End and it earned four nominations making that theaters total to 12 nominations, the most of any theater. The Branagh Company earned seven nominations, including six for “A Winter’s Tale” starred Kenneth Branagh and supporting star Judi Dench, making it her 15th Olivier nomination. She’s won six awards and one special award, the most of any performer. The awards ceremony will be take place April 3 at London’s Royal Opera House and can be seen on the Olivier Awards’ YouTube channel worldwide outside the U.K. The Royal Academy of Dramatic Art (RADA) and London Academy of Music and Dramatic Art (LAMDA) are no longer with Drama UK, an advocacy group for vocational drama training. But should Americans care? Probably not, especially if it’s a quality drama school you seek. It seems like it’s more of an accounting issue as the problem centers on high accreditation fees, which don’t fluctuate due to the size of the school — 80 vs. 14,000, according to BroadwayWorld.com. The group also certifies vocational university and college courses. The “eighth” story in the Harry Potter series will be its first stage play and is scheduled to open in London during the summer of 2016. If you, and your family, love all things Harry Potter, start planning a summer family vacation to London in 2016 to catch “Harry Potter and the Cursed Child Parts I & II,” a stage play sequel taking place 19 years after the end of the book/movie series. Tickets go on sale Oct. 30 for performances that begin in late May 2016 at the Palace Theatre, London, with an opening planned in July 2016. Sign up for priority booking here. Based on an original new story by J.K. Rowling, Jack Thorne and John Tiffany, the “Harry Potter and the Cursed Child” play is written by Thorne and features a cast of more than 30. It will be directed by Olivier and Tony award winner Tiffany. Patti LuPone has a vocal ally in Benedict Cumberbatch, currently starring in the title role in the West End production of “Hamlet,” who pleaded with fans to turn off their cell phones during performances of Shakespeare’s drama at the Barbican Centre. “I can see cameras, I can see red lights in the auditorium. And it may not be any of you here that did that but it’s blindingly obvious, like that one there, that little red light,” the NYTimes reported Cumberbatch said to theatergoers who crowded around the stage door during the first days of a limited engagement in London. Its 12-week run ends Oct. 31 and tickets sold out in about seven hours. Earlier that night he stopped then resumed the famous “To be or not to be” soliloquy because saw a “little red light” near the third row during the performance. 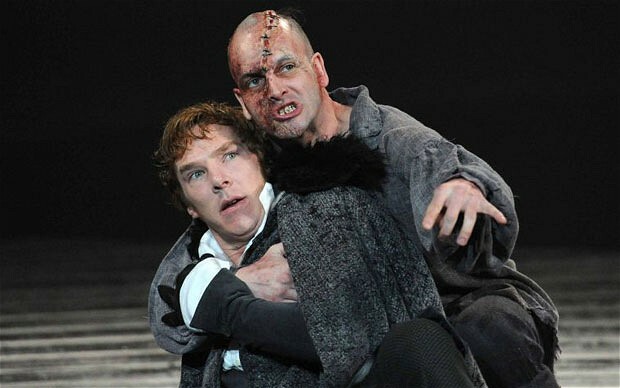 Benedict Cumberbatch (left) and Jonny Lee Miller (both of whom play Sherlock Holmes characters on TV) starred opposite each other in the NTL production of “Frankenstein.” To make things more fun, they learn both roles and switched parts during the production. (Photo: National Theatre). The National Theatre in London is mounting a new production of “Hamlet” and people are going wild trying to get tickets to the 12-week limited run. They’re calling the box office and signing on to multiple devices from such places as Siberia, New Zealand, Peru, Japan and Indonesia to get the coveted tickets. And why? Benedict Cumberbatch. Helen Mirren stars in the Broadway production of “The Audience.” She won the 2015 Tony Award for Best Actress in a Drama for her performance. If you can’t get to Broadway to see Helen Mirren in her Tony Award-winning performance in “The Audience,” National Theatre Live is offering an encore presentation of the Olivier Award-winning London performance at venues around the world beginning June 25. Both the London and Broadway productions include Olivier and Tony awards winner Richard McCabe, who portrays Harold Wilson in Peter Morgan’s 2013 play. I saw the NTL showing at Monmouth University, West Long Branch, when it first was offered. As a fan of English history and fan of Helen Mirren, I loved it. Even better, I think director Stephen Daldry is a genius and have admired his work for years as well as the work of six-time Tony Award-winning set and costume designer Bob Crowley. It boasts one of the most remarkable onstage costume changes I’ve seen in more than 40 years of theatergoing — a mature Queen Elizabeth changing into her younger self in seconds. Click here to find a venue near you. At least I hope you find one. Tickets are usually $22 for adults, cheaper for students.